A customer who owned a farm in Olympia Washington was looking to build a large 2 story pole barn to house his horses and farm equipment with plenty of storage space. 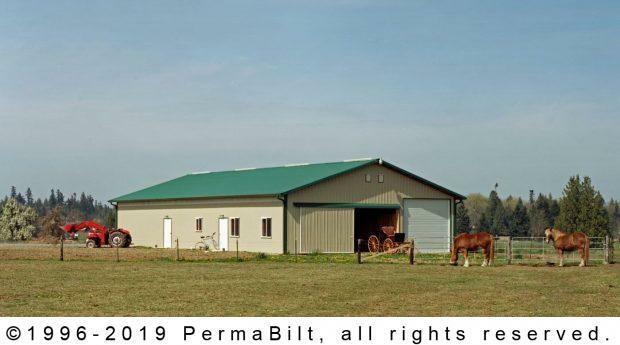 This 80 foot plus pole barn included four large PermaStalls® (14’ x 14’) which comprised of three 2” x 6” Standard & Better Tongue & Groove walls, seven feet high. The fourth wall was a grilled stall front with grilled 4’ x 8’ sliding door, feed door with drop bar latch, and a removable grilled stall divider (which included Tongue & Groove wood on the stall separation wall). Also an important feature were all the aluminum components which prevented rust, corrosion and cribbing. And for the horses to gain access to their enclosed paddock, each stall included a 4’ x 8’ unpainted wood Dutch door. Additionally, the customer added a second story 12’ x 28’ loft with guardrail holding 100 lbs. per square foot. This is important when adding horse feed for the winter months as it can be quite heavy. Other elements that were added were garage doors, windows, walk-in doors such as our own PermaBilt® insulated door which included a polyurethane foam core which reduces sound and possessing superior insulation. It took planning but once the building was up, our customer was very pleased on how his building turned out.